This product uses premium-quality henna leaves that have been harvested in Sojat, located in the Indian state of Rajasthan, well-known as being the finest growing region in the nation. The first-picked henna leaves, sun drenched during the growing process, are left to dry in the sun. The leaves are then ground into henna powder. 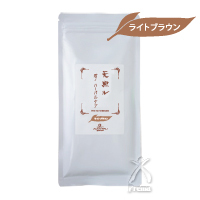 Aluminum packaging seals in the fresh fragrance, along with the well-sifted plain henna powder. The plain henna coats the cuticles of the damaged hair, adding volume and shine. *Gray hair will be orange after dyeing. The final color will differ, according to the amount of gray hair to be covered, hair type, and application time. *For those people who wish to soften the appearance of brighter hair, we recommend that you continue to apply a dark brown or indigo color. 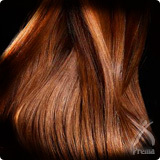 *There will be individual differences, but first-time users may find that colors do not permeate the hair well initially. With continued use, the hair will gain greater shine and luster and colors will merge naturally with your original hair. *A feature of natural dyes is that hair color changes over one to two days following application, resulting in a more natural look thereafter (dependent on hair type and condition).